Have a question for the Government Affairs Committee? Click here. The Government Affairs Committee (GAC) keeps abreast of regulations and proposed legislation and guidelines related to clean water industry challenges, regulatory policies, and funding opportunities. We have conducted a webinar on Water Quality Trading, developed position papers on Operator Training and on PCBs, and have supported committee members to take part in WaterWeek, where one person from each state meets with their members of Congress and/or their staff in Washington D.C. and share with them the Water Quality priorities for WEF-PNCWA members. We meet by conference call once a month and have one in-person meeting at the Annual Conference. Today, EPA announced the availability of approximately $5.5 billion in credit assistance for water infrastructure projects under the Water Infrastructure Finance and Innovation Act (WIFIA) program. This financing will help support approximately $11 billion in total infrastructure investment. PNCWA members reported "Messaging has focused on positive funding opportunity but somewhat daunting demands. Professional congressional staff were clear that our efforts have lead to major water funding increases and inclusion of water in the infrastructure bills. The EPA described several areas of focus that will influence our industry over the next year." 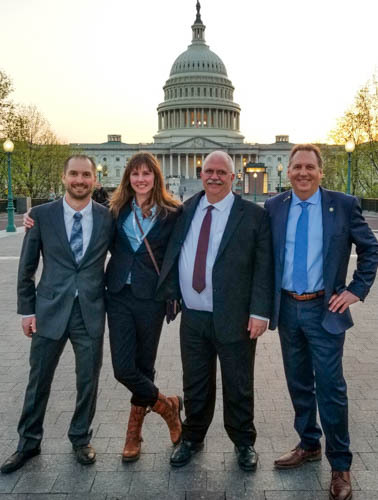 Pictured L-R are John Beacham (City of Post Falls), Caitlin Hubbard (Lake Stevens Sewer District and NWWOS president), Bob Baumgartner (Clean Water Services), and Mike Ollivant (Parametrix).